Around 20 new documents have been published, available here on this release. Land Mobile has more details about this launch by Small Cell Forum here. The initial deployments of LTE did not pay too much emphasis on X2 interface being present. Inter-operability was another issue for which X2 didn’t work very well. One of the major benefits of having an X2 interface is that different base stations or eNodeB’s (hereafter referred to as just eNB’s) can talk to each other and coordinate to make sure interference is kept at the minimum, especially on the cell edges. The Macro-cell’s had the provision for the X2 interface from the beginning, which formed the basis for Inter-Cell Interference Coordination (ICIC). Initially, the Small-cell’s didn’t have a facility for an X2 interface amongst them or with the Macro-cell. The support of X2 for Small-cell’s was added in 3GPP Release-10 and 3GPP Relese-11 (hereafter referred to as just Release-10 and Release-11) as seen in the picture. X2 for Small-cell’s is crucial for Interference management in HetNets. A key area of standardization needed to support small cells relates to the procedures to assist co-ordination with macrocells over LTE’s ‘X2’ interface. This document surveys standards currently in place to support frequency domain interference coordination,time domain interference coordination, mobility robustness and mobility load balancing. 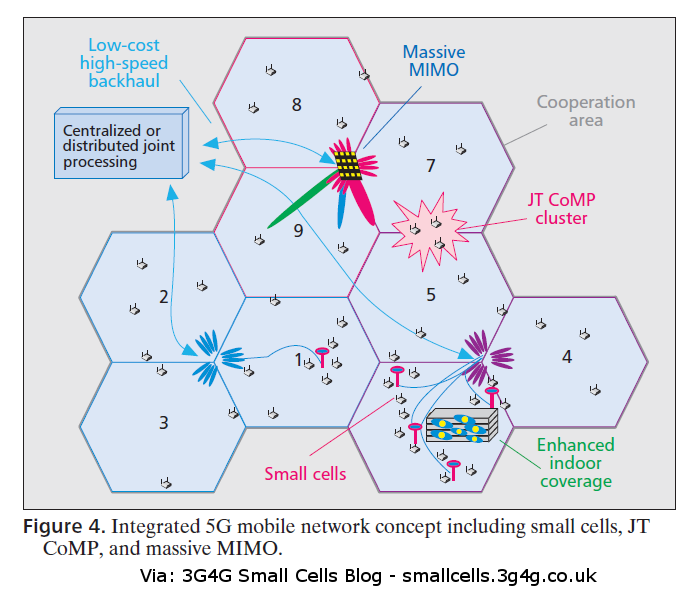 Embedded below is a recent paper from IEEE Communications Magazine on the role of various techniques in 5G. The main focus is achieving higher spectral efficiency. From the paper: "From a high-level perspective, there are three main contributors to reaching higher spectral efficiency: advanced interference mitigation, small cells for densification of the network nodes, and massive multiple-input multiple-output (MIMO), that is, a significant increase in the number of antennas at the base station and potentially also at the terminal."